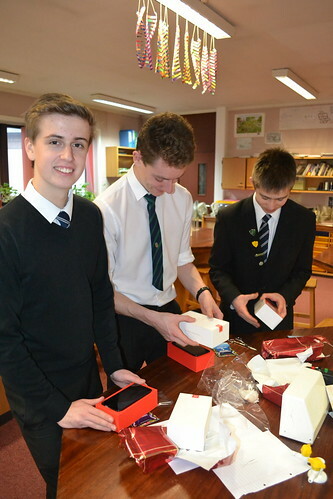 Mr Peter Jaroz of the Skye and Wester Ross Fisheries Trust came to Gairloch High School in December; to present three S6 pupils, Roddy Macrae, Jack Wright and Sean Quinn, with OnePlus5 Smartphones (worth approximately £500 each) as a reward for working in their own time to develop an App for the Skye and Wester Ross Fisheries Trust. The app is designed to collect data about fish catches and invasive species as well as give the user up to date information about where to go fishing in Wester Ross. They put a lot of time and effort into the project and have forged links with SWRFT and UHI as a result of their efforts. This has given them an insight into the world of work and app development. The programme is ongoing and may be an opportunity to work with other GHS pupils in the future. We would like to say a huge “thank you” to the Skye and Wester Ross Fisheries Trust for giving us such a fantastic opportunity to work on an app that will be used by so many people. Receiving the new phones will be a great chance for us all to progress with our careers as we can keep better communication with peers and other members of the work force. This job has given us an incredible amount of experience in working in the real world, having to meet deadlines and to work through all the problems that may have arisen along the way. These new and more developed transferrable skills will help all of us in our future careers and are rare in the work environment. We would all hope to see future collaborations between Gairloch High School and Skye and Wester Ross Fisheries Trust so more people will be able to benefit from it in the same way we have. We would like to thank Kevin Ginty for providing experience and knowledge in areas where we previously had none. We would also like to thank Peter Jarosz and Dr Close for bringing the project to us and allowing us to take it on. We really appreciate having this unique opportunity given to us.